Do you ever have one of those days where nothing seems to be going right? I had one of those days recently when I was making these granola bars, partially because of my three failed attempts at this recipe! Yes, three. Who fails at granola bars? I do. I desperately wanted to make baked granola bars. Doesn’t it just sound dreamy? Well, you know what happens when you bake granola bars (at least in my experience)? They become dry and crumbly, and you’re left with a big pan of granola – not what I’m going for. Any advice on this matter? I’d love to know. In the meantime, back to the drawing board. Instead of giving up altogether (which I did consider), I looked back on my favorite granola bar recipe for a little inspiration and found just what I needed. There’s no need to bake your granola bars once they’re formed in the pan. The only baking required is for toasting the oats and nuts to give them more flavor and crunch. Dates provide the “glue” to hold these together and keep them 100% naturally sweetened. The best part? This recipe is simple: 8 ingredients, 20 minutes (plus chilling), and easy-to-master methods. These make the perfect easy breakfast or on-the-go snack. They would be especially ideal for hiking, camping, and whenever you need a post-workout nibble. If you try this recipe, let me know what you think! Leave a comment, rate it, and don’t forget to snap a picture and tag it #minimalistbaker on Instagram! I’d love to see what you come up with. Cheers, friends! Preheat oven to 350 degrees F (176 C) and line an 8x8-inch baking dish with parchment paper. 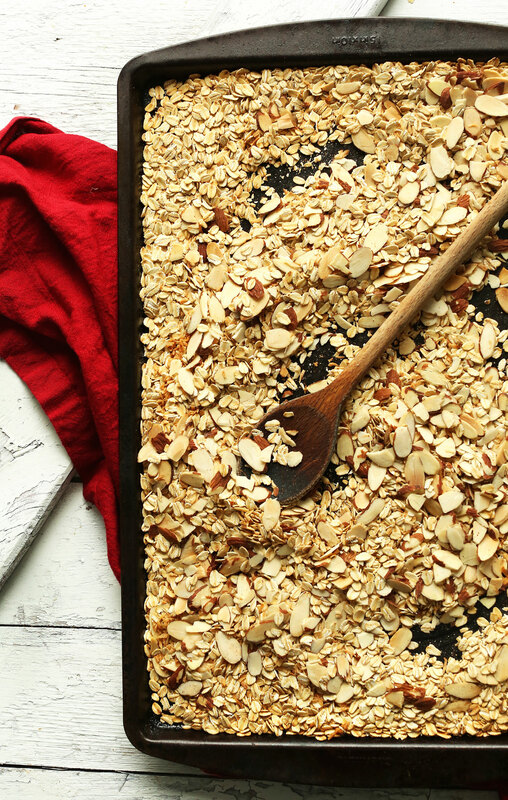 Add oats, almonds, and sunflower seeds to large baking sheet. If sunflower seeds or almonds are already roasted, don’t put them on the pan and reserve to add later. Bake for 13-15 minutes, or until light golden brown, stirring occasionally. In the last 5 minutes of baking, add the shredded coconut and stir. Once everything is light golden brown and toasty, remove from oven and set aside. In the meantime, add peanut butter, coconut oil, and maple syrup to a small saucepan. Warm over medium heat until melted, stirring to combine. Remove from heat when well-mixed and pourable - about 3-4 minutes. Set aside. Add chopped dates, toasted oats, nuts, seeds, and dried fruit (optional) to a large mixing bowl and top with peanut butter mixture. Stir well to combine, using the spoon to mash the dates and make sure they’re evenly distributed - this will help the bars stick together. Transfer mixture to prepared 8x8 dish and use a spatula to spread evenly and pack down. Lay a piece of parchment paper on top and use a drinking glass (or similar shaped object) to press down firmly and pack the mixture in place. It’s important it’s packed well or they can crumble when cutting. Place in freezer for 30 minutes to set. Cut into 9 even squares, or 10-12 bars (amount as original recipe is written // adjust if altering batch size). For best freshness, store in a sealed container in the refrigerator for 2-3 weeks or in the freezer for up to 1 month. I prefer mine in the freezer, as they stay freshest that way. *If your dates aren't sticky and moist, soak in hot water for 10 minutes then drain thoroughly. *Loosely adapted from my Healthy 5 Ingredient Granola Bars. For less coconut taste, you can use refined coconut oil. We haven’t had that problem with the crunchiness- perhaps the oats needed to bake longer. Or you could also maybe try baking the bars? Hope that helps! I made these and they are terrific. Versatile too – dark choc chunks, sesame seeds, pumpkin seeds would all work well in this recipe. OMG! Love this recipe! This is my fourth week in a row making this! I have a four month old baby, so I have one of these bars for breakfast every morning – saves so much time day to day! I made these and they completely crumbled into granola! Disappointed, but still taste yummy. I made this using macadamia butter for my pregnant niece- who was eating rubbish store bought museli bars for breakfast. She loved them, and I am VERY happy to be providing quality nutrition for her and little X… added some sesame seeds too, for calcium. Thanks very much for the recipe. Making next batch right now! Can I change the dates for something else? Hi! You could try figs or prunes! Made this for a pre workout morning snack…. WOW they are so amazing! Love these granola bars. I used 200g of dates and added mixed nuts and seeds. They are superb, highly recommend. Excited to try these! Thank you! Just made these and refrigerated for an hour and just got it out and it all crumbled apart … Why ?! ? I made Rosewater Granola from Thug Kitchen’s recipe and it made a huge batch. I was looking for granola bar recipes and used this recipe(I’m a huge fan of all your recipes) I made almond pistachio butter instead of the peanut butter and I just took them out of the freezer and OMG, they’re perfection! Delicious, chewy, crunchy and sliced beautifully…. Thank you so much! WHOA. Brilliant! Thanks for sharing!! I have been making your healthy 5 ingredient granola bars religiously every other Saturday ever since I tried them for the first time, more than 6 months ago. Those very few times that we ran out I would panick.. And the only reason we’d run out was that anyone who’d come over to our house would demand to be given at least one bar to take home with them – not on the schedule! With more free time on my hands now, I decided to try this recipe for a change – it’s SO good I think I’ll have to put that into the rotation now instead. Thanks again Dana for such great recipes! I then put it all back in a bowl, added honey and baked again hoping it might stay together. Though it tasted yum, it was a disappointment and waste of time. Think it would be possible to adapt this recipe for spent grain from home brewing? Any suggestion on how? Made these this week: Amazing! Definitely the best granola bars I have ever made from scratch. My husband is pretty pumped about them too; He’s always on the hunt for the perfect bar, and says this is it!—That illusive heavenly mix of chewy and crunchy. I used honey instead of maple syrup (what I had on hand), added chia seeds, and crunched all the nuts up into small pieces in my food processor before mixing them in the batter. We’ll be making a big batch of these again very soon (because the first batch disappeared wayyy too fast). Thank you! I just made these and they are delicious. But u fortunately most of my pan is crumbled granola instead of bars ?. What can I do to save this deliciousness? Can I add something to try and reset it? Thank you for starting to put the weights on recipes too – I’m in the UK and although i have a set of measuring cups I find it really confusing to bake that way (I guess its what you’re used too!) A teensy request – could you put the oven temps in Celsius too? I should probably know the conversion by now but I still have to google it every time! I’ve started doing that on more recent recipes, thanks! I made these bars last weekend and they were great, but the end product was bunch of chunks of loose granola. Maybe try crunching the nuts up into smaller pieces? I did that and the bars held together great. You also might need to add more “sticky” stuff: peanut butter, dates, etc. I make granola bars using this recipe, http://allrecipes.com/recipe/81298/playgroup-granola-bars/, I’ve adapted it to make granola so I’m sure you can make is vegan/gluten free! Yummmmm!!! Just made a batch with my 10 year-old twins. The goal was to make these so we can take them to school/work for snacks. I can totally see myself eating this whole pan on my own. They are SO good! Thanks! I’ve done oat based bars before in the oven but they come out soft – not like a traditional granola bar. BUT they are delish. The base is oats, almonds, dates, maple syrup, salt and vanilla and then you can add in protein powder if desired and fruit of your choice. Can date syrup be substituted? how much would you use? Thank you. Who cares if they are baked or nut? As long as they turn out as good as they look – surely it’s inconsequential? Hard ball sugar is the answer! Based on the pictures that you have posted, it doesn’t look like you are having problems with the bars crumbling into granola. BUT!..there is a way to make the bars solid if you want to imitate a Kind bar or a Larabar. In the world of pastry and baking, heating sugar to different temperatures renders your product into whatever it is you are trying to achieve. In this instance, you are probably looking for hard ball stage 250F – 260F. You need a candy thermometer to measure the temperature of the sugar you are heating up. So, whether you use, regular refined white sugar, maple syrup, brown rice syrup or big bad ole corn syrup, heat it up to hard ball stage and mix it in with the rest of your ingredients. 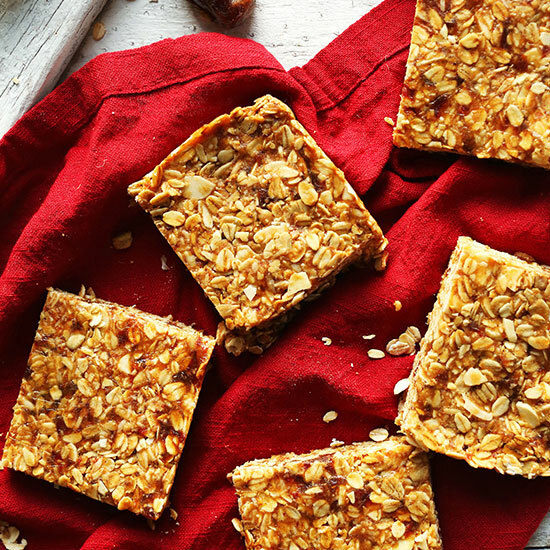 Flatten out in your pan and within 20 minutes you can cut your granola into perfect bars. Hope that helps. Google ‘stages of sugar’ to read more about it. Perfect fall snack! 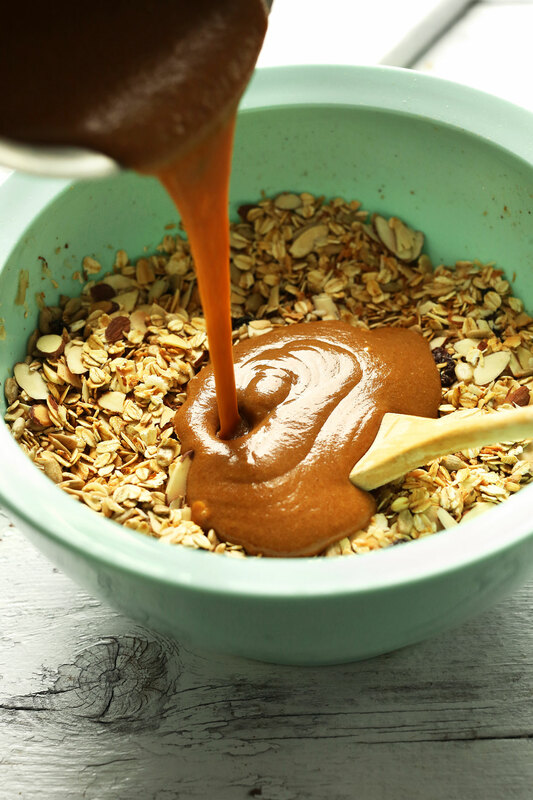 Peanut butter and granola are SO GOOD together! I could eat them forever and ever! SOY LECITHIN!!! Use it with brown rice syrup and fruit puree and you can bake the bars without them falling apart. I use the “Clif-type FUBARs” recipe from Please Don’t Feed the Bears. Had some in a baggie at the bottom of my pannier for the first week of a bike tour, and they were still intact! Oh my! These are so very yummy! I love how they stay nice, and chewy at room temperature and still retain the crunch of the toasted nuts! I might have snuck in some vegan chocolate chips! Be sure to wait til the batter cools a bit before adding the chips. Thanks for all your delish, simple recipes, Dana! So kind! Thanks for sharing, Danielle! These look delicious! I may need to get myself into the kitchen and whip some up! These look perfect for meal prepping! I can’t wait to give them a try! Oh, these sound delicious! I love your minimalist approach to baking. I will definitely be trying these out. The granola bar recipe is simply awesome and just so easy to make. I can’t wait to try it! Thanks Sarah! It’s part of the job! I’ve been on a bar making-and-eating craving lately, and these look divine! I find it a real pain to make date caramel (my whole kitchen is sticky every time, can’t seem to keep it in the bowl where it belongs), but they’re such a treat after working-out, or in the afternoon at the office. These look lovely, thanks for the recipe! They look delicious. When I make granola bars I use egg white as a binder while baking, but that is not really an option for vegans. But the idea of pre-toasting oats is great. I think it’s even less messy. Peanut butter and oats? I’m in! These look so yummy, and seem like the perfect meal prepping breakfast! Thanks for the recipe! Sounds delicious! If I want to add chocolate chips into the recipe, when’s the best time? Dana! These look amazing. 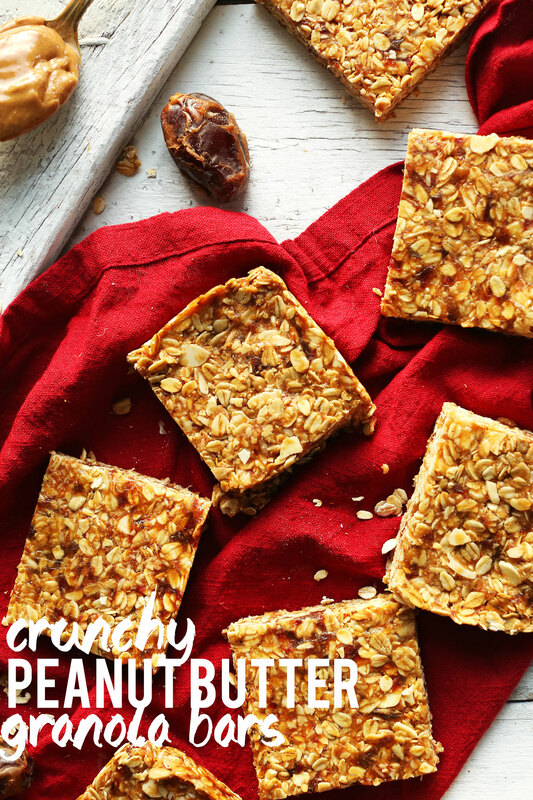 I’m always a huge fan of baked granola bars; sometimes you just crave a little crunch. Hate to say it but you’re not the only granola bar -challenged baker :) Looks like you overcame your issues splendidly. ha! Glad you get it, Heidi. Granola bars should be so easy (shakes fist). You had me at Peanutbutter! This looks so good, oh my need to make it as soon as possible! Thank you for always creating these swoon-worthy recipes! Hi! I can’t consume dates, could you suggest an alternative?? I’m also looking for a date substitute to use as a binder here…any suggestions would be greatly appreciated! Maybe a little more peanut butter (or other nut or seed paste to keep it sticky), and I often use mashed banana to bind it. The Oh She Glows blog has a nut/seed/dried fruit bar with banana, and it works like a charm. However, I always bake my banana bars, not sure how it’ll turn out without baking the banana (probably a bit of a sticky ball instead of a crunchy bar). Hope this helps! Any other dried fruit, such as figs or cherries? Yummy! I LOVE granola bars. They’re so easy to make, healthy, and totally satisfy my need for something sweet. Much better than a sugary candy bar – no guilt. I love that your recipe calls for only a few simple ingredients – simple tastes better in my opinion, and it’s totally budget friendly that way. I only use a few ingredients in my granola too. I’m already a fan of your HEALTHY BROWNIE GRANOLA BARS I’ve made them many times by now and I’m definitely gonna give a try to these ones! I LOVE peanut butter but only in this one brand, crazy right! 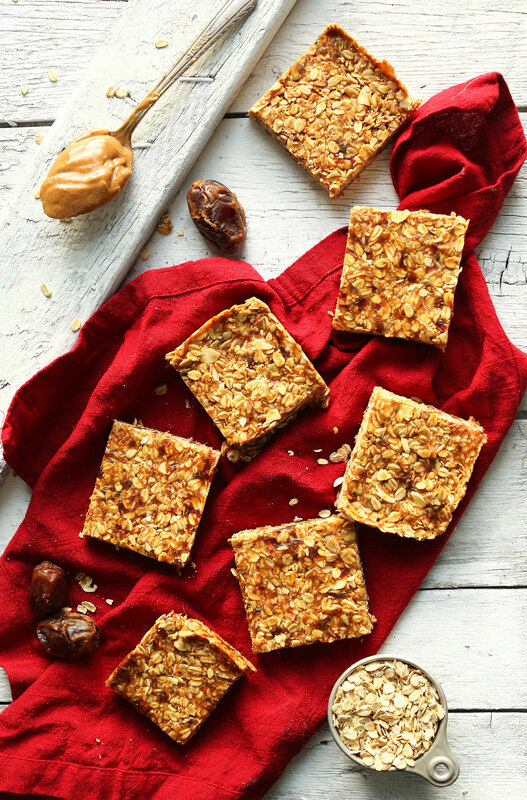 I love granola bars… I’m making these for sure!! This is a culmination of pretty much all my favorite things in life, ‘specially if I added chocolate, which would probably not qualify as quite healthy, but I <3 peanut butter + chocolate!! Ohyumohyum, I cannot w.a.i.t. to make these (with or without the chocolate ;) )!!! Thanks again for a wonderful recipe, and persevering through the granola bars turned granola (though I can't imagine that would be bad… :) )!! Not only do these probably taste like the bomb dot com, but they are absolutely gorgeous! These granola bars look delicious. Cant go wrong with peanut butter. The sunflower seeds would add a great flavor! ?? Love all of it EXCEPT — not a fan of peanut butter in my bars. Is there anything I could substitute with? Almond butter or sun butter! Thanks! Looks great. I’m going to try with Sunbutter as we have nut allergies in the family… i’ll skip the almonds and try pumpkin/chia/sunflower seeds. Any other ideas? I have had the same issue over the years! It turns out that, unless you’re making a predominantly flour-based recipe (which, let’s face it, is basically a cookie), baking only ruins the bars. Pre-toasting the ingredients, on the other hand, makes a huge difference for the better! Agreed. The recipe needs sugar melted and caramelised to hold the mixture together, just like pralines. I’ve tried making granola bars for my blog and ended up with a pan of granola more times than I can count! I can totally relate to your frustration there. 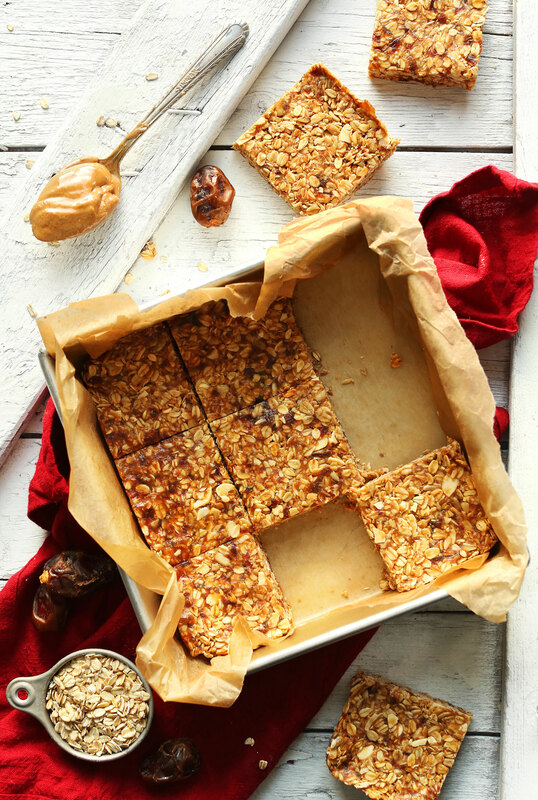 Peanut butter is one of my absolute favorite foods so I can’t wait to try out these granola bars!